Last month I had the privilege to serve as a maid of honour at my friends’ Yuxi and Ben’s wedding in Hefei, China. I wanted to make something very special for the couple, because they’re very special people to me. So I made them this wedding portrait in porcelain and bronze to signify their bond to each other, and to Enchanted Doll. My friends, I wish you an everlasting love! From time to time I have the pleasure of repairing a broken porcelain part, but this week I had to get repaired, because I broke myself! I had arthroscopic knee surgery, and at such an inopportune time too, because I only have 48 hours left to finish Madame de Pompadour’s photoshoot. She needs to ship out to Hong Kong on Monday. I know I should feel more stressed out, panicked even, about being incapacitated right before a hard deadline, but as it turns out the pain meds they have me on are pretty strong, so all I can muster is a mild, detached concern. I hope I don’t have a heart attack tomorrow once my meds wear off and I can grasp the concept of time again. The good news is that I’ve been discharged from the hospital to recover at home, so all is not lost yet. 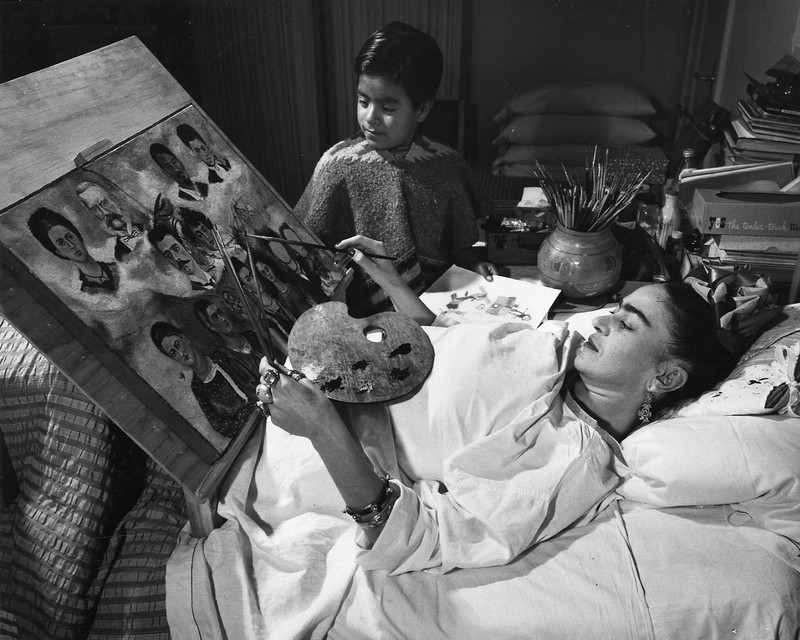 I’ll direct the photoshoot from the wheel chair – Frida Khalo style. If she could make art and attend her show opening from her own bed, I can certainly manage to take some pictures from a chair, with a few stitches in my knee. I have a feeling it’s all going work out OK. But then again, it might be just the meds talking. We’ll see Tuesday. I’d noticed that you guys were curious about the Spinal Pendant I wore in my short, glass-engraving video, so I thought that perhaps you’d enjoy knowing more about it. I made it for myself as a one of a kind project, but seeing how it caught your attention, I’m considering making it available to you as well. The pendant is manufactured from original feline vertebrae and cast in Sterling Silver. The remains of this kitty were found on the side of the road, after it’d been struck by a car, but I’d like to think that a part of it still lives on in this wearable silver sculpture. This is a very sensual piece of jewellery because it’s free-moving. There are 15 joints connecting 16 vertebrae, which makes it very bendable. I’m always playing with it. Stroking it brings an odd comforting sensation that helps me concentrate, kind of like moving a rosary between ones fingers. Or like petting a cat. I’ve used these bone molds before in a couple of my doll projects, such as the Beetle and the Crow, but this jointing system is more advanced and realistic than my previous attempts. It gives a better range of movement while maintaining perfect alignment. And, to smoothly transition from the pendant to the chain, sculpted a double-bail at the top of the biggest vertebrae in the shape of human pelvis. I’m an urban, high-rise apartment dweller. My living-working-gardening space is limited. Some people have breakfast nooks or solariums next to their kitchens, but my breakfast nook is a Machine Room, which also doubles as my Hanging Gardens. About a year ago I read on the news that just looking at growing things and being near them increases our emotional well-being and productivity, and since then I kind of lost my mind and developed a bit of a plant hoarding problem. I currently have 120. Living alongside my manufacturing equipment always creates a frustrating functionality-vs-aesthetic conflict because I hate visual clutter. I need my machines/tools because they help me make art, so I try to integrate them into my home decor as best as I can and still be comfortable living amongst them. It takes a lot of curating. Feels like a game of Tetris sometimes. Needless to say, my machines and I are very close. Sometimes late at night I throw some rugs down on the cold tile floor, pour some tea, light candles for atmosphere and just hang out with them while pretending we’re in a lovely garden. It’s kinda nice. Hola doll lovers! You may or may not have noticed, but this summer I literally put doll-making on a shelf and left it there for 3 months. This little favourite of mine has been sitting on this shelf in her fancy Chinoiserie house robe for 2 months, with no one but a tin fish-pet for company. My lovely Pilea plant demonstrates the time’s passage quite well, as it gradually swallows her up with its growing juicy foliage. Another month in this spot, and she’ll disappear from view! There have been some rumblings of discontent and a growing restlessness at my prolonged absence and ‘abandonment’, but I really needed this time off due to a quite severe burn out. I love making dolls, but that is not the only thing I love doing. There are numerous non-doll art projects that have been simmering on my back burner for several years because dolls always took priority. It got to the point where I could no longer paint another doll eyelash or sew another bead on yet another doll dress without feeling sad and resentful and pressured by expectations. So, this summer of 2015 was my creative break from dolls and my indulgence in other art forms. I built furniture! I designed interiors! I reorganized and cataloged all my beads and began renovating my art studio. I delved into horticulture! I went on wilderness adventures! I hung out with friends, sometimes in the wilderness. I took (and passed) a swift river rescue certification course in Montana! I even ordered a colouring book on Amazon (Secret Garden by Johanna Basford) and spent days laying in the grass, sipping cold beer and blissfully colouring in somebody else’s drawings without any concern for my doll output – something I would normally consider to be utterly pointless and detrimental to my productivity! But it wasn’t – it was a pressure release valve. And today I walked into my studio and noticed this doll on the shelf half-swallowed by a plant, and I thought:” Hey you. Long time – no see”…and I began to dream of dolls again. It will surprise absolutely no one to hear that being an artist gives one existential angst. Or perhaps having existential angst is the reason one becomes an artist. It’s a chicken vs egg dilemma, but whichever came first, sometimes seemingly mundane things trigger it, such as organizing my art supplies. I really like keeping things tidy around my home studio, but my collection of fabrics for doll costuming is starting to spill out of my bathroom closet. I need to keep my toilet paper somewhere! I have a policy of buying only the fabrics I require for an immediate project, so as to not accumulate vast amount of it in my home. However, this minimalist practice conflicts with being a maker, simply because fabric to a doll artist, is what paint is to a painter! There is only so much of hypothetical painting a painter can do without having an instant access to a full palette of paint colours, ready to paint on a moment’s notice! I mean, it would be ludicrous to suggest that a painter only has enough paint in the closet for just 1 painting at a time, right? Then why do I feel so conflicted about having a closet-full of different fabrics? Is it because fabrics take up more space than tubes of paint? Is it because there is infinitely more different fabric in the world than there are paint colours? So, how does an artist live minimally, exactly? I think about this all the time. If it wasn’t for my art practice and all the art supplies and equipment related to it, I think I’d hardly have any possessions at all. Just some furniture to sit on. But does my art truly justify the environmental footprint I’m leaving on this planet? After all, aren’t I just contributing to the clutter problem by having ‘clutter’ to make more ‘clutter’ with? Sometimes I wonder if I’m better off not having anything and not making anything. Artist are makers. We are compelled to create objects with our hands for some reason. We make stuff from other stuff, therefore we need to buy and have stuff to create our stuff from. Why? It’s some sort of a pathological compulsion, I think, and I sure am thankful that doll-making is my particular pathology. I could have had it worse – I could have had a criminal compulsion, that compelled me to do bad things because they made me feel good. Instead I lucked out with a need to make dolls. Whew! And that’s the kind of stuff that goes through my head when I clean. Organizing sure is an intense activity, full of angst and nihilism. I think I’m gonna stop now and go do something else, before I conclude that nothing whatsoever matters and everything is hopeless. Guess I’ll go make a doll. It almost always makes me feel better. Takes my mind of things. My next doll is near completion! This is a little preview of her tattoo. Once it’s fully engraved, I’m going to try something different with it and see if it works the way I’m hoping. This doll has been an ongoing project for the last year and I’m pretty excited to finally reveal her to you within a month, along with a few other interesting things. Wink-wink. Enchanted Doll is over – I’m retiring. Dear friends, I bring some difficult news that probably no one wants to hear – after 10 exciting years, I’m closing down Enchanted Doll and retiring from the doll profession to pursue a career in interior design. Please let me explain. I am sad, but also immensely relieved to be making this announcement. The truth is, things have not been the same with me for a while – I’ve been changing. Over the last two years I’ve been slowly falling out of love with dolls. This paradigm shift began to happen imperceptibly and incrementally at first, manifesting in uncharacteristic procrastination and chronic absence of inspiration, but has finally grown to a profound and deafening dislike of my work and my life. So much love, labor and energy had gone into building Enchanted Doll to where it is now, that it seems inconceivable to walk away from it all, and yet I have to. I’m all burnt out and I need a change. Interior design has always been a competing interest of mine, and over the last few months it’s emerged as a more dominant creative force than doll-making. I have to pursue it and make it happen. I really appreciate all the love and support you’ve given me over the years, and I hope my retirement from the doll world will not be perceived as a let down of you. This site will be active for a few more weeks while I phase out and transition to a new direction, but eventually we’ll take it down. These ten years have been amazing, but it’s time to make a fresh start. Wish me luck in my new pursuit. I hope to become a famous interior designer and possibly even an architect one day! Thank you all and Remember Enchanted Doll! In case it was not clear, this was an April Fools’ joke. I have no plans to retire from doll making. I do love interior design though, that part is not a joke.